For the most part, enclosures are about the same size, approximately 15-20 inches. This typically allows for about 8-10" of usable interior space, in addition to heating/cooling electronics. Smaller enclosures (11-12") are available for compact cameras, and larger enclosures are available, with room to install ancillary equipment, such as wireless access points and routers. Non-metallic: Non-metallic housings, made of polycarbonate or other plastics, are generally the lowest-cost housing option. They provide basic weather protection, but do not allow for as wide a temperature range as metallic models. Nor do they offer the same level of vandal resistance or range of options as metallic housings. Non-metallic housings can be found for as low as $50 without any electronics (no heater/blower). Standard metallic: The bulk of the housings offered in the industry are metallic, typically aluminum. Metallic housings are better able to handle wider temperature ranges, and offer greater vandal resistance than non-metallic housings. Metallic housings without any electronics can be found online for about $100 and up. Pressurized Housings: In some locations, such especially hazardous areas, and those prone to large amounts of fine particles, specialized pressurized housings may be used. These housings maintain positive internal pressure, usually using nitrogen gas, to prevent the ingress of dust and moisture. Hazardous Locations: For surveillance of hazardous locations (highly flammable), a specialized category of housing must be used. Installation of equipment in these locations is a nuanced topic, however, outside the scope of this report. For more information, users should see our guide to Hazardous Area Surveillance. Enclosures today are normally hinged, so that the camera may be accessed from the top. 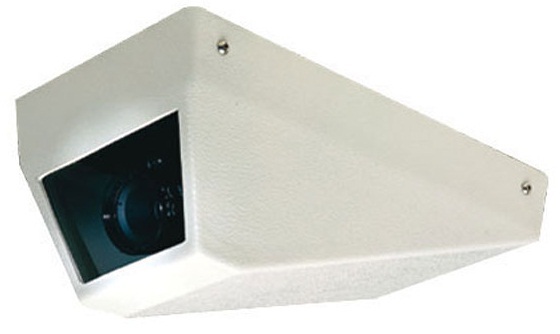 Older enclosures, and some specialized enclosures use a slide, which the camera is mounted to. This is then removed from either the front or rear of the housing, depending on construction. Hinged enclosures are normally preferred, as they allow for better access to the camera while leaving it in place. Heater: Heaters are the main means of managing lower temperatures in camera housings. These usually consist of a heating element beneath the camera, but some housings intended for extreme low temperatures use multiple elements, lining the interior of the housing. Heaters generally add $30-40 to the cost of a housing. Blower: A small fan or smalls may be used in housings to remove excess moisture, and to expel hot air from the enclosure. Humidity is the most often overlooked detriment to camera performance in outdoor enclosures, and must be taken into consideration in any temperate location, and especially coastal areas. A build-up of moisture may cause condensation, or frost in colder areas, to form on the lens, obscuring its view. 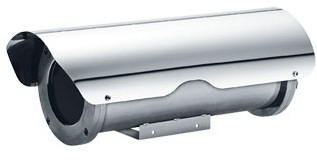 Blowers typically add more expense than heaters, an additional $50-100, depending on the size of the enclosure. Sunshield: The sunshield, a supplemental guard which is mounted to the top of the camera housing, leaves an air gap between the shield and the housing itself. This air gap allows heat to radiate from the top of the housing, and also acts as a buffer, removing heat radiating from the sunshield. Many sunshields also extend further than the top of the camera housing itself, which can shield the camera lens from damaging direct sunlight in some cases. Sunshields are the simplest means of protection from heat, and also least expensive, typically $20 and under for standard housings. Higher temperatures: For areas with extreme high temperatures, air conditioned or liquid-cooled enclosures are also available. These are very rarely used, typically only in desert installations, or industrial facilities. The most commonly-deployed housings are those without electronics, for mild locations, and those with both heater and blower, for cooler areas. Many camera manufacturers who offer OEM housings only offer these two models, forcing integrators to turn to a third party if other configurations are required. Low voltage: Typically, housings are powered by 24VAC power, supplied by a low-voltage power supply, either near the camera or centrally located. This method requires a separate two-conductor cable be run for power, in addition to the UTP cable for signal. High voltage: Some housings are powered directly by 110VAC (or higher) power, eliminating the need for transformers, but requiring an electrician for installation in most cases. This is more common in areas where high voltage already exists, such as lighting poles, as it reduces the number of connections which must be made. PoE: A relatively recent development, PoE power has started to become viable for powering outdoor housings with heaters or blowers. This may be standard 802.3af PoE, or 802.3at Hi-PoE. Generally, the PoE level required corresponds to the temperature range of the housing, as those with greater temperature handling require more power. Feed-through: Using these models, the cable is fed through the wall through the back of the wall arm, and up into the housing, without being exposed. This is more secure, as UTP cable, or even flexible conduit often used for these connections, may be cut with little effort. It also provides a more aesthetically pleasing installation. Exposed: Many housings do not use feed-through mounts, however. In these cases, flexible conduit is connected to the housing from the wall, and power and data conductors are run through this. 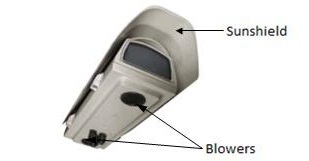 Care should be taken when running exposed conductors, as those within reach from below may be vandalized or pulled out of the camera housing. Wipers/washers: For housings exposed to the elements, wiper/washer systems are available. These systems are akin to car windshield wipers, on a small scale, and remove rain and dirt from the housing's window, triggered by a camera's relay output, or RS-485 in the case of analog cameras. Wiper/washer systems add hundreds of dollars to the housing's cost, and considerable bulk, since washer liquid must be kept at the housing location. Tamper switches: Tamper switches are offered as an option on some housings. When tied into a camera's digital input, they may be used to notify operators that a camera's housing has been compromised. Tamper switches are a relatively low-cost option, adding between $15 and 30 to the price of the housing.